They were the Shardan. They were the chosen people, the guardians of Hell, the rulers of the sea. 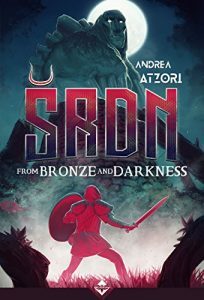 Thus begins the story of Bronze-Age warriors on Sardinia in a desperate battle against the Incubi, who have started pouring out of the netherworld and wreaking havoc on any villages they come across. Drawing on historical records, archaeological findings, and his own wide-ranging imagination, Andrea Atzori invites us to imagine what life might have been like on this Mediterranean island during the 13th century B.C. And with gigantic (and sometimes translucent) demons, tense and up-close battles, and mystical cults, who wouldn’t want to accept that invitation? (Read Atzori’s fascinating blog posts on Acheron’s site to learn about the historical and archaeological contexts of this story). The Shardans, having lived on their island since time immemorial, are considered the gatekeepers of Hell: in the distant past, their ancestors built structures calls “nuraghe” to serve as beacons and “stitches” in the Earth, to keep the demons in the netherworld where they belong. In ŠRDN, though, one of these “sacred seals” has collapsed, and the Incubi (“Mamuthones”) are swarming all over the island, killing and destroying as they go. The “Shepherd,” who is supposed to round up any Mamuthones that emerge (usually, there are only a few wandering around at one time), has lost his way, and is wandering around the island, accidentally leading increasingly-restless Mamuthones into vulnerable communities. It is up to Karnak of the Antigori clan, and Saurra, twin sister of the Shepherd and herself a member of the Jana religious order, to find the Shepherd, have him round up the wandering Mamuthones, and bring the villagers together to mend the broken Seal. Atzori keeps us mostly in the minds of Karnak and Saurra in order to bring these Bronze-Age people out from behind the veil of history and make us see that we are not so different from them, despite the intervening centuries. For instance, Karnak is devastated when, upon returning to Sardinia from invading Egypt, he finds that his wife has been killed during a Mamuthone attack and it is up to the remaining islanders to try and stop further devastation. Saurra, on the other hand, is stuck between hoping and mourning for the twin brother who was taken from her a decade before and turned into a mindless, blind Shepherd dedicated to leading the Mamuthones around. This brother, Eloe, is neither truly alive nor dead, and Saurra vacillates between wanting to put him out of his misery and setting him back on the right path so he can save the island. ŠRDN is, ultimately, the story of a ferociously resilient people coming together during a crisis to save themselves and their way of life. Despite being orders of magnitude smaller than the Mamuthone giants, the Shardans use swords, shields, arrows, and anything else they can get their hands on in order to defeat their enemy. This is a fascinating peek into the ancient world and what would subsequently become a part of Italy. I encourage you to check it out.